Home|Floral Library|Peace Lily – Spathiphyllum spp. Decorative Life: Weeks, months to years, depending on use and care. Maintain growing mix moist and do not allow salts to build up. Also, increasing growing media pH decreased the severity of Cylindrocladium disease. Spraying plants with gibberellin at 250 ppm can stimulate flowering some 9-11 weeks later depending on cultivar. Leaves are oval or elliptical, narrowed to a point, on stalks coming directly from the soil line. Flower head consists of leaf-like spathe surrounding column-like spadix made up of small flowers. Often confused with its cousin, Anthurium. Chill sensitive, store at or above 60F. Exposing plants to 50F for one day or 55F for two days can cause chill related problems. Symptoms include leaf wilting and/or water soaked looking spots on the leaf margins. 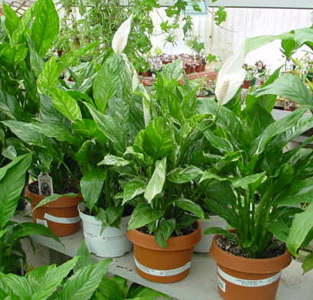 Spathiphyllum: Greek for leaf-spathe, referring to the character of the spathe. A spathe is a leaf or bract subtending (below) a flower cluster. It is often colored and considered part of the flower as in this species. Essentially pest-free. If grown in Florida, plants should have been produced under 70-80% shade. Grown under lower light levels, plants are better adapted for the commonly encountered lower light levels when placed indoors. Poole and Conover (1993) stored ‘Petite’ at 36-46F from 1-4 days and subsequently noted water-soaked spots on leaf margins within a few days. As summarized by Brown (1988) of the work by Wolverton et al. (numerous years), this is one of many foliage and flowering plant species that can remove air pollutants such as formaldehyde and/or benzene often found in cigarette smoke from interior environments.